1. Lessons learned by stepping out of your comfort zone. 2. Diversity, inclusion, and communication..
3. Interfaith communication and understanding. 4. Practical ways to strengthen your spiritual foundation one day at a time. 5. Changing your life, 1 week at a time. 6. What to do when you wake up one morning and realize your life is not what you expected it would be. 7. The power of self-definition. 8. Being brave enough to tackle something big – in little pieces. 9. Setting and executing on resolutions, promises, and plans. 10. Walking through a grieving process and coming out stronger on the other side. 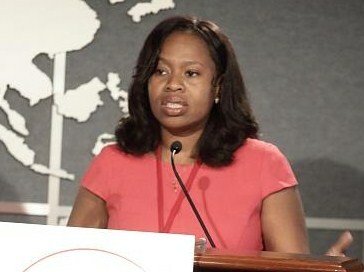 She has been an invited speaker at Ilisagvik College in Barrow, Alaska, Stanford University in Palo Alto, California, and the National Bar Association (Section for Business Law) in Abuja, Nigeria to speak about personal and professional topics, and has also been invited to speak about her “My 52 Weeks of Worship Project” at DePaul University in Chicago, IL, Washington University in St. Louis, Trinity United Church of Christ, and the Chicago chapter of the Black Data Processing Association. To book her for readings, signings, or campus presentations, email my52wow@gmail.com.